When our family met to make arrangements for my father-in-law’s funeral my mother-in-law communicated that she would like for me to sing at the funeral. Accepting her request I had to start praying about it right away. “What song do I sing? What about music? Please dear Lord keep me from crying!! ” Our pastor friend, the funeral director and I had pre-arranged that I would sing in a small room off to the side of the large room where the services were to be held. First off I wanted the focus to be on Jesus, my sweet father-in-law, the words of the song, and not on me. Having my plan of how and when to exit to the small room I felt well prepared at the start of the service. Without knowledge of what the three of us had previously planned another gentleman working with the funeral home closed the bi-fold doors to that small room just as the pastor began the service. At this point there was no way to slip into the small room and obtain the one microphone without causing a big distraction. My prayers went into even greater levels of desperation besides “Lord help me not to cry” they went to “what on earth do I do now? 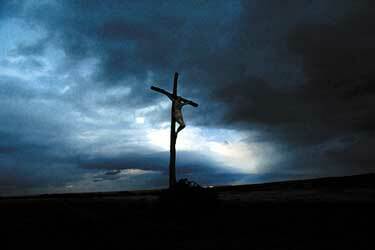 ?” Then my eyes were drawn to the cross hanging on the wall directly above my father-in-law’s casket. There was just enough room for me to stand in front of the bi-fold doors to the left of my mother-in-law allowing me to face the cross instead of the room full of people. Knowing that tears are extremely contagious for me even with strangers there was no way I could look into the weeping faces of those I love and be able to sing. The words “just focus on the cross and sing about my ‘Amazing Grace’ ” kept speaking to my heart as I prayed. It was easy to communicate to our pastor where to stop with the podium adorning the one cordless microphone allowing for minimal distractions to be made. God got me through with no tears I just had to look toward the cross. This has become the answer to everything in my life…Look toward the cross. When times are hard and I don’t know what to do…look toward the cross. When I feel weary…look toward the cross. When things are going great…look toward the cross. My hope, my strength and my help comes from the Lord.